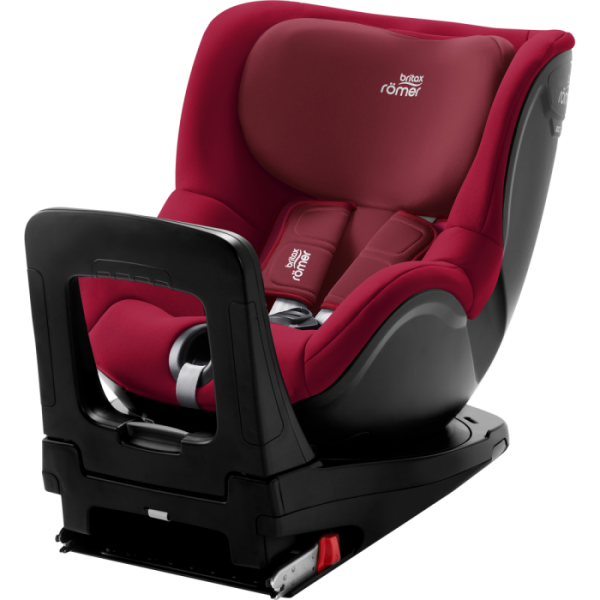 Britax Römer Dualfix i-Size is a safe, but very heavy seat (16.3 kg = 35.9 lbs). In my personal view, as this seat is not a carrier that you should be able to put on your pram, its weight does not really matter – unless you permanently want to put it from one car to another. Still, you can use it for a newborn as well by having 12 recline positions both rearward and forward facing, including a flat-lie one for maximum comfort and safety for newborns. You can turn the seat in 360 degrees so that you can put your child easier into the seat. SICT (side impact protection) implemented by a special steel element for outstanding safety. SICT and the patented Pivot Link ISOFIX System keep the baby out of harm, no matter if it comes from the front, side or back. Britax Römer produces the Dualfix i-Size seat in Germany to be able to control every step. The cover can be taken off for a wash without having to remove the harness. Since it is a relatively big seat, that suits children up to 4 years, you can put in its newborn insert with energy pads that absorbs energy and provides extra care and security, and keeps the babes in an ergonomic position. The adjustable rebound bar can be moved by 8 degrees in order to prevent the seat from tilting in case of an impact and also to give extra 10% space to the child. Longer rearward facing position provides much more safety. The reason is that in the event of a frontal collision – which is the most common type of accident on roads – the back of the seat gets the most energy of the impact, and the rest is divided among the head, neck and upper body. In contrary, when a child travels in a forward-facing seat, the energy of the impact goes on the structure of the seat and its restraint system – reaching much more the child’s body. Britax Römer recommends using a rearward-facing seat as long as possible. The side wings are deep and protective to protect the baby from side impact. The V-shaped headrest controls the movement of your baby’s head. It can be adjusted from the front together with the harness. The 5-point harness cannot even be compared with a 3-point one regarding safety. Especially if they are also covered with neoprene, such as the Dualfix i-Size, to minimize the movement of the child gently in an impact. The support leg is adjustable in order to position the seat in the most stable way in the car and to reduce the risk of tilting or moving. Britax Römer Dualfix i-Size is available in several different colors. I hope you liked this review and if you have any question about the Britax Römer Dualfix i-Size seat or want to leave your own personal experience, leave a comment below.